This error is announced in the application as Parse Error and it’s due to the fact that the version of Android installed on our device is lower than the version required for the installation of Mobdro. This error can obviously be fixed by updating the operating system of our mobile device to the latest Android version available. 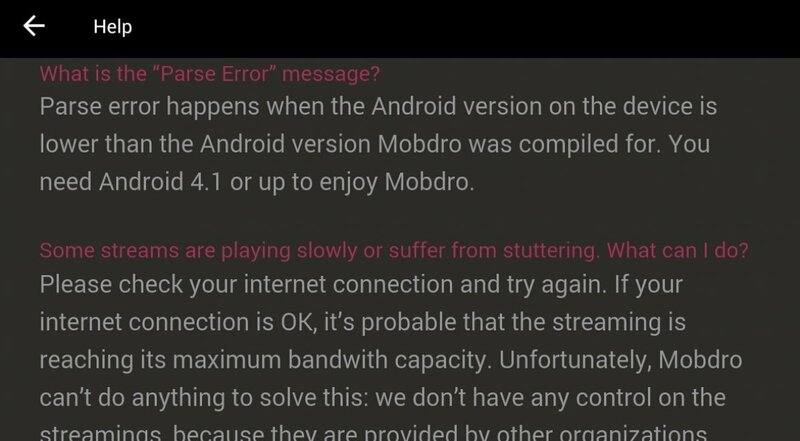 Mobdro demands version 4.1, therefore, if our smartphone or tablet isn’t at least on this edition, we won’t be able to install the app even if we’ve managed to download the APK file. We have to take into account that this error could appear after updating our app even if we’ve been using Mobdro to that date without any problems. In any case, this requirement is within the reach of almost any smartphone as all low-end phones are running at least this version, and not only the latest Samsung Galaxy or Google Pixel. This is precisely one of the keys to the success of applications of the likes of Mobdro or You TV Player: its requirements can be easily met by the majority of users. This, anyone can access a huge catalog of TV channels, series and other contents quickly and for free. If we add to the latter the simplicity to browse through the contents, its different ways to filter the latter, the speed to connect to all the online contents or the fact that we don’t have to download anything, this is definitely one of the best applications to watch TV online from our phone or tablet provided that we’ve got a WiFi connection.